Two weeks ago I wrote about the Zucchini Chop, an exercise in removing unnecessary leaves from my courgette plants to direct energy to the fruit. Since then I've enjoyed a daily exhibition of beautiful new flowers and tender leaves emerging to protect the fruit while the remaining leaves have swiftly grown to fill the gap left after the cutback. The plants now stand proud, healthy and large once more in their space - a dual edged sword as it happens. On the plus side, children are reluctant to race down the narrow path in the middle of the veg patch for fear of scratching their shins but, not so good, is that smaller children (the under-5s) are less able to easily access the beds for watering, a task they like to help with. I think it may be time for a few more leaves to come off! 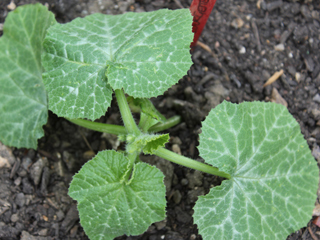 1) Identifying courgette flowers: male flowers are long and slender on a slim stalk, almost like a rose. Female flowers are the ones that make the courgettes and have plumper flowers on a chubbier stem. The female stem looks like it will become a courgette; in some cases the slender courgette can be picked with the flower still attached and the whole thing battered and quickly fried. Delicious. 2) Encouraging more fruit: It's essential to leave some male flowers; without them, bees have no pollen to carry across to the female flowers. It's this act that pollinates the flower, causing the courgette fruit to form. 3) Photographing veg: evening light - if you catch it right - is so much more forgiving than harsh middle of the day sunlight. The midday sun creates hard shadows and burnt out texture in photos; however great the subject may look to the naked eye, I'm always disappointed with the results if I photograph in strong light. The veg patch is shaded by late afternoon and the last of the day's sun is sometimes reflected back onto the veg by being bounced off nearby windows. This is a perfect time (around 6 - 7pm) in the summer to take photos. Clearing the long walled border last Friday meant tackling not only the insidious weeds and ivy roots but also digging up the potatoes which had magically appeared from tubers overlooked at the end of last year. Frank was the spade man for the day and he was charged with going very carefully around the fruit trees and self-seeded sunflowers - no mean feat as the sunflowers were being propped up by the potato haulms. He did a smashing job, although I did have a jug of sunflowers to enjoy indoors at the end of the day. The main treat though was the sheer amount of beautifully coloured potatoes that he found in the soil. Purples (Blue Danube), pinks (possibly red Cara) and creamy golds were revealed with every forkful. I took them home and washed them carefully; half way through the operation, I thought I'd better weigh them. So, with the mud removed and dried off, I popped them on the kitchen scales: 6.4 kilos, almost 14 lbs! Not bad for a free harvest, eh? Plenty to share amongst friends - and I've still got my Vivaldi, Charlotte and Pink Fir potatoes to uncover! Three cheers for summer! See you tomorrow for the Saturday Snap! I've always loved the idea of weaving a few flowers through the veg patch, an idea that really took root after watching Alys Fowler in her Edible Garden on the BBC last year. I already had sunflowers, nasturtiums, calendula and flowering herbs but this year have truly succumbed to a more floriferous outlook by sowing a small patch of sweet peas. These (in the photo) are Spencer Mixed. I also have Old Spice which seem mostly to be either a deep wine colour or ballerina pink. Very pretty, a beautiful smell and, by picking often, the stems are encouraged to keep flowering. 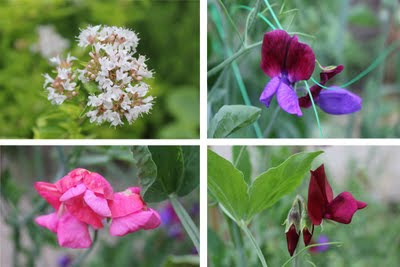 I've enjoyed these so much that other flowers have crept in as well: Honeywort (which has yet to flower), Monarda, Honesty, primula, poppies and violas. Seeds of cornflowers, nigella and bergamot have been sown (possibly a bit late as they've been shaded by the courgettes). Just this week I planted a Rudbeckia into one of the walled borders (next to the lilies which no-one had the heart to dig up when the ivy went) and a plant-sale echinacea (cone-flower) went in next to beans. My first love will always be for veg but I confess to a moment of heart-fluttering excitement on finding a Cowslip (primula veris) of RHS Merit provenance on the shelf at Morrisons for a mere £2! A bit of research reveals that the leaves are traditionally used in Spanish cooking as a salad green and the plant is also the main food of the Duke of Burgundy butterfly. I live in hope. Meanwhile, my fleur-ting with florals will continue as I'm currently reading Joy Larkcom's Creative Vegetable Garden which is chock full of horticultural happiness on every page. It's been a busy week, almost too much happening in fact so, to make the most of another (frankly, by now unexpected) day of dry weather, I zipped down to the veg patch early, postponing my weekly slog to the supermarket. Blue skies and warm sunshine graced the veg patch by 7.30 a.m. (not exactly the dawn of my post title but good enough), a welcome turnaround after the night-time rain that had still been falling three quarters of an hour earlier. So, I got my shot, then managed a second closer photo and then Columba Palumbus, who'd had enough, simply turned tail and walked off, ploughing it's way through the ivy. Onwards to the veg patch to plant out some Strawberry Popcorn, recently gifted from Victoriana Nurseries in Kent. I'd ordered this a tad late so it needed to go straight in to a bed which I'd already prepared for it, having mulched it a few weeks ago and then covered it to keep it warm and weed free. 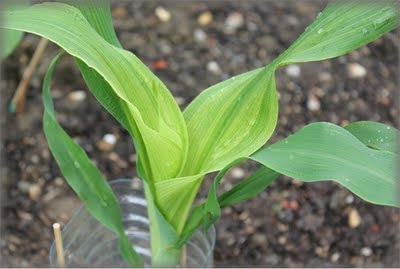 The first plant went in and, in the blink of an eye, a small grasshopper jumped on to the corn leaf. My first sighting of the year. Quietly and quickly, I reached again for my camera but I could have taken my time, he stayed there for half an hour or more, basking in the warm sunshine. Had he travelled from Kent? I don't know; but I do know his presence added to the enjoyment of my morning. I spent a happy few hours in the Veg Patch yesterday, got loads done, got two Saturday Snaps and now keeping my fingers crossed for more dry weather so that I can get the rest of my planting finished. I've been very lucky with the weather over the past few days; having been out to sow more seeds, the skies have obliged with a generous watering. When I've needed courgette flowers, the sun has warmed the plant, the bees have appeared and fruits formed. During a trip to the farm yesterday, we strolled in warm sunshine and I was able to take some Lemon Balm cuttings from their wild growing clumps. Safely back indoors, it rained during the afternoon. Going out to pick sweet peas in the evening (having been told that picking encourages more flowers), I noticed that the nasturtiums were studded with diamonds! Raindrops glittered on the waxy leaves and this water, puddled in the centre of a leaf, twinkled brightly like a large glass drop. Even better, just as I was turning to go home, a bee buzzed along straight into an open female courgette flower to pollinate it! Not a great photo, but lovely to see the bee doing his work and a magical moment to end the visit on. 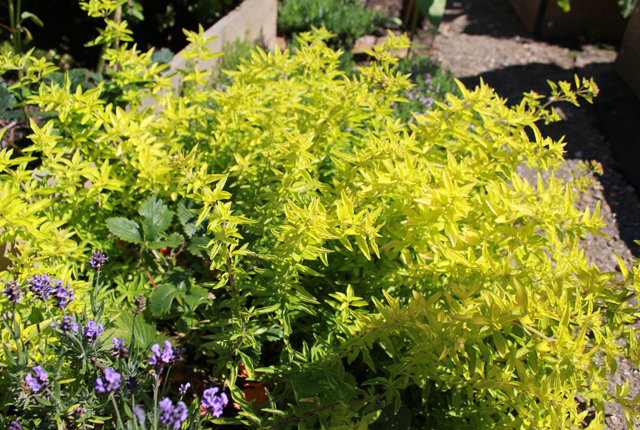 Today: if the rain holds off, a bit of weeding and pruning is on the cards for me! Fingers crossed and happy gardening! This is my first year of growing courgettes so I was thrilled to see the plants flourishing in the few short weeks after planting out, although the way their magnificent but prickly leaves overspill onto the paths through the patch is slightly daunting. As I watered around the veg patch on Friday evening, my Zimbabwean neighbour (who has a wealth of experience in veg growing) came over for a chat. The common names of plants often differ between our countries and he was curious about the courgettes. Having established what the plant was, he told me that in his country the whole plant would be eaten: flowers, stems, leaves, fruit. Surely the leaves are too spiny for that? Not at all, apparently they soften in cooking. My plants, however, had been insufficiently watered (guilty as charged, although the weekend deluge will have rectified that) and the stems were too tough. He demonstrated by cutting a lower leaf close to the stem and peeling back the strings. The stalk was hollow and the flesh rigid; if it had been tender, he would have saved it from the compost heap and taken it home to be eaten, although the best leaves are further up the stem. So, lesson one: courgettes need lots of water. There was further advice. "The plant is having to share the food between the fruit and the leaves. You do not need the leaves near the ground." Well, that made sense to me. So, knife in hand, I sliced where I was directed to and leaf after giant leaf came away. Soil was revealed (enough to sow some quick radishes or shaded spinach), air could circulate around the plants, sweetcorn was rediscovered and an achievement shared. Really, an enjoyable, companionable, useful and educational evening where another curve of the learning spiral was successfully negotiated. If I'd thought about it, I should have used the same angle to take the photo. Sorry, but I hope this will illustrate nicely the after-effects of the (rather drastic) chop. Does anyone else do this? And has it worked for you? I'd love to know! I've grown this from an unpromising looking little seedling, bought for pence at a plant sale in May last year. It came from a Victorian garden I like to visit (or, at least, from one of the volunteers who keep that garden looking so inviting). They hold a plant sale every year to raise funds for the National Gardens Scheme and a few Monarda cuttings had been brought along for the sale. I was unfamiliar with the name Monarda when I bought it but a quick Google search revealed that I had a plant that would be very attractive to bees. Excellent! and the photos of what it might look like were very exciting. A very happy purchase indeed! I had just the one fragile little plant and lots of concerns about its survival but, by surrounding it with a cut-down 5 litre water bottle - and staking the 'cloche' in with bamboo skewers - it was protected from buffeting winds and inquisitive fox cubs and has thrived in my herb bed. It spreads, so I now have a clump of monarda, a fact which I'm delighted about - especially now it's flowered. On a more factual note, the flowers are edible, making an attractive addition to a salad. The leaves and shoots can be cooked and added to salads but it's not the same plant that gives Earl Grey tea is citrus flavour: that's Citrus Bergamia. Naturally antiseptic, a poultice of the leaves can be used to treat skin infections and wounds and an infusion of crushed leaves is said to be good for headaches and fevers as well as being both a stimulant and carminative. Apparently the leaves can taste bitter, (think spearmint, oregano, thyme), so I'm unlikely to be enjoying a cup anytime soon ... although with a spoonful of honey, it might make a refreshing alternative to paracetamol for the occasional headache! It grows up to 3 feet (1 metre) tall and the leaves can be cut down in the Autumn when it's finished flowering, ready to start again in Spring. It can be propagated by seed or cutting or dividing. It's also reputed to improve both the flavour and health of tomatoes when planted nearby. Awesome! I'm more than a little bit in love with this plant. I have no idea whether this is M. fistulosa or M. didyma - if any of my more knowledgeable friends could advise on this, that would be most appreciated! Shall we just have a close up? I'm a little late in posting this so I'll wish you all happy Sunday gardening with hopes for dry spells (we've had a fairly soggy Saturday here in London). Oh dear, 8th already and the last month has turned without the veg patch progress being recorded. Time for an update, I think; the days are slipping away and my brain is already planning winter veg. I remembered to snap a few pics a week before the end of June and then took a few more a day or so ago, both of which are a week away from a true end-of-month but between them will provide a useful log of information for next year. Take these courgettes, for example. Planted out early June, 4 weeks later, leaves the size of dinner plates with a few flowers. Good progress or good horse muck, who knows? Tra-la-la, it works. The UK weather in June gave us some sunshine (plus 2 days of heatwave), brisk breezes and plenty of rain - often in the same day! Nights were cool and dawn often gave way to clear blue skies that clouded over by mid-morning. Endless days of buffeting winds made seed sowing and planting out quite challenging. Weeds flourished in the wet and warmth; continuously clearing them off became a necessary chore (which I haven't quite kept up with, despite a 2 hour session in a downpour). Early beetroot and carrots were enjoyed, beetroot tops, spinach leaves and herbs were added to salad (Oh for a few chickens to add freshly laid eggs to this! ), french beans were resown along with sweet corn, radishes, spinach and wildflowers. The lavender, oregano and thyme flowers in the herb bed are a sight to gladden the heart on a sunny morning. Recently though, I seem to have lost the habit of popping down every evening, there's just too much else to do. So, the spinach has bolted and new baby leaves are not quite ready, spring onion seeds are still in the packet whilst I continue to buy from the supermarket, the next lot of carrots are still to go in. Shame on me, most disorganised! On the bright side, onions, garlic, carrots and beetroot are bulking up, the courgettes are flowering - in fact the sweet corn is struggling as most of it is hidden under the courgettes (is it too late to transplant, I wonder?). This week's photo is dedicated to the memory of Conrad Quashie, one of the three 'gap year' boys who died in a coach crash in Thailand last Monday. Conrad was known, and loved, here at York Rise as his mum is a close childhood friend of one of our group. He regularly visited over the years and played out with our children, being of a similar age. He was popular, warm, funny, kinda cool as well, being the eldest; a truly lovely boy with a natural and easy charm, one of the best. Conrad, his mum, his sister and all their friends and family are in our thoughts, the same for the other two boys, Max and Bruno. Their deaths have touched our lives here with sadness and brought unimaginable grief to their families. It's unfathomable that this has happened and I wonder, how does life get this unjust? Today's photo of Echinacea Purpurea was taken in the Urban Physic Garden in Southwark, about which I'll write more later.